The conference was organized by the Local Government Development Foundation (LOGODEF) and the Konrad-Adenauer-Stiftung, one of the Forum’s long standing partners. Invited speakers from Asia, Australia and Europe shared regional and country perspectives on the topic with over 100 local stakeholders including mayors, academia institutional heads and local governance practitioners. 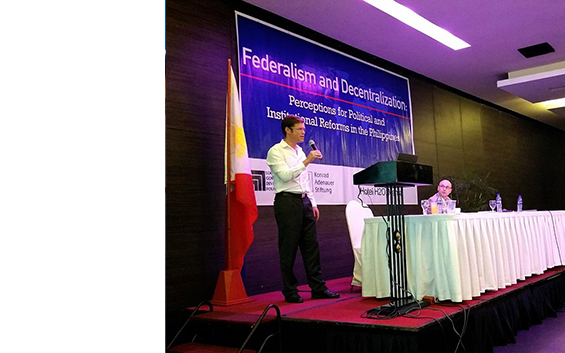 The first day introduced conceptual conundrums and regional comparative experiences from Africa, Asia and Europe, followed by a more focused discussion on Asian cases of decentralization and federalism on the second day, in light of the national discourse in the Philippines. The conference concluded with an opportunity to meet Senator Aquilino “Koko” Pimentel III who opened the panel on “Strategic Outlook for the Philippines” with the emphasis on the need to work towards a more inclusive agenda for the Philippines in making the case for a federal system. The conference ended with a policy panel on next steps for the Philippines, taking note of presentations heard during the conference and its main takeaways.